You would never expect an earthquake to hit Mt. Pleasant, but with the addition of three new “Tremor Tables” Sacred Heart Academy students are shaking up standard science lessons. Students in grades 7 through 12 are learning about engineering, math, physics, and earth science with a new hands-on approach. These tables help simulate earthquakes in a fun and safe way. Students can experiment by constructing their own buildings, test seismic wave effects, compete in Science Olympiad tower testing, and more. The Kellogg Youth Fund has helped make these “earthquakes” possible for students in their exploration of STEM sciences. Sacred Heart Academy was able to expand their STEM Lab resources by purchasing the three Tremor Tables, add-on packs, and other related supplies. These fun new tools have helped encourage students to expand their knowledge of our planet. Although the new Tremor Tables are primarily used in the 7 through 12 grade classrooms, the new tools are also available to K through 6 grade students. Since September of 2017, students have experienced how these natural events can shape our planet. Sacred Heart Academy students no longer have to create mini-earthquakes by hand. These tables have opened up a vast number of scientific experiences and memories that can help shape future careers for these young students, or future seismologists. Having a newborn is a whirlwind of emotions: excitement, love, and unfortunately, stress. New parents all of over the world feel the same way every day. The Isabella County Child Advocacy Center (ICCAC) is here to help families that need a little extra support. ICCAC partnered with Cribs for Kids to provide families with a “Safe Sleep Survival Kit.” This kit includes a Graco Pack and Play (with top bassinet), a Halo SleepSack, a Pack n' Play crib sheet, a pacifier, educational material with a safe sleep message and baby's first book. Not only does this kit help families in need, it ultimately saves lives. The Women's Initiative Fund provided funds to ICCAC to ensure families in need have access to these lifesaving kits. 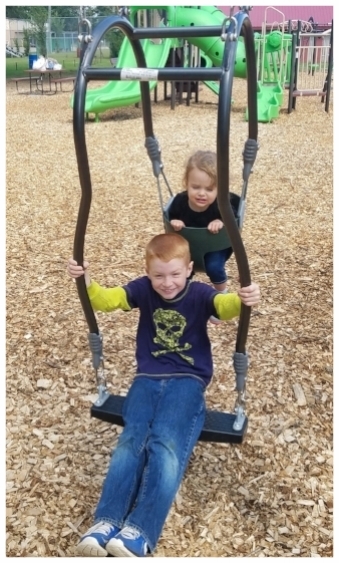 For 33 years, ICCAC has worked to provide safe environments for families with children. The survival kit program is an extension of that goal. Many local human service agencies and local hospitals teamed up with ICCAC to select 10 Mt. Pleasant families to receive the Safe Sleep Survival Kits. This practice of providing sleep kits is new to our community. The goal of the program is to reduce the number of infant deaths that occur due to unsafe sleep practices. With the success of this program, there is hope to continue to protect those that cannot protect themselves. During the summer break students often find themselves looking for ways to occupy their leisure time. The 2018 Chippewa River Writing Camp was able to provide an educational experience for 12 upper elementary school students from the Mt. Pleasant area. The eager students, led by two elementary teachers, explored the Central Michigan University campus and learned how writing and technology can intersect. During their four days together, the students saw several great features of the university’s campus, including the botanical garden, museum, and Park Library. With support from the Kellogg Youth Fund, the camp was able to support students with demonstrated need to continue their education through scholarships. The fund was also able to provide stipends for the two teachers that led the young students. The goal of this camp is to help engage students in their creative writing abilities, while also exploring a college campus and utilizing what it has to offer. The Chippewa River Writing Camp set a goal to reach 20 students. They plan to reassess the program with the hope of spreading the information more widely to perspective participants. In 2018 the Chippewa River Writing Camp was able to provide 12 students with memories that will impact them for years to come as they continue in their education and passion for writing. 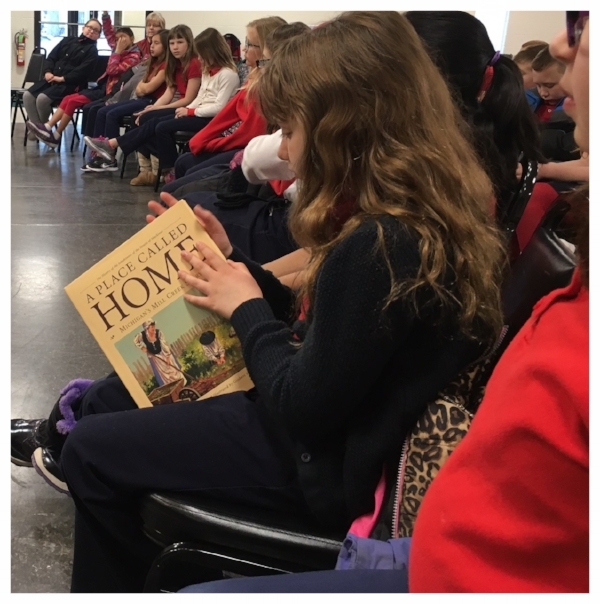 Sacred Heart Academy (SHA) wanted to bring awareness and excitement to their students about the importance of reading, writing and history in early 2017. They set a goal to have nationally-known author and Michigan native, Janie Lynn Panagopoulos, speak with students. The Kellogg Youth Fund made this goal possible for SHA. Panagopoulos is noted for the authentic historical fiction she has written about Michigan and the surrounding area. She spoke to individual classes at SHA in March, tailoring messages to each grade level. She provided information in a way that makes the past come alive for her readers. For the last 20 years, Shepherd High School has hosted an After Prom Party. This event is a safe, positive and entertaining alternative to other not-so-safe options for students during the late night hours after prom. The goal is to host a huge party with lots of fun activities and prizes for Shepherd High School Juniors and Seniors. Groups of parents have volunteered to organize this event every year. The Shepherd Community Fund in Honor of Robert Bates provided funding for last years’ event. On May 6-7, 2017 the party was held at Morey Courts from 11 PM to 3 AM. Each year the event is a little different in order to attract new students who may have attended the previous year. 2017’s After Prom Party included: three different inflatables, Karaoke, ice skating, volleyball, basketball, dodge ball, Wally ball and a game of corn hole. There was also a photo booth available for students to take pictures with their friends. The attendance in 2017 was up by 58 students, totaling 178. “One of the best parts about our prom is After Prom, a place for us all to hang out together and do activities we usually don’t get to do,” said senior, Abby Schlorff. 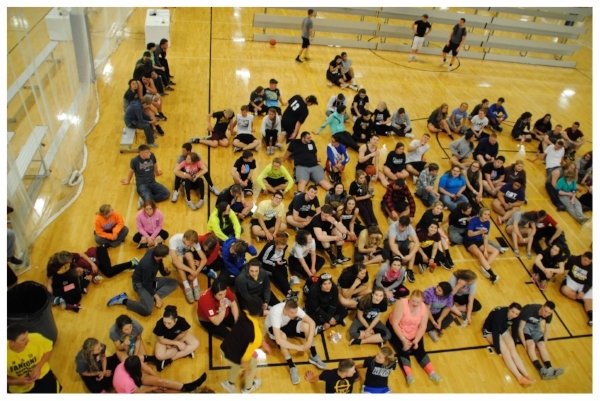 The After Prom event will continue as long as there are volunteers who are willing to help with the three fundraisers that are hosted throughout the school year, and the community continues with their generous donations. “Being at After Prom is one of those high school moments that I won’t forget,” said senior, Sam Travis. More than one in seven people in Isabella County struggle with food insufficiency. Community Compassion Network (CCN) is a charitable organization with an ecumenical outreach, dedicated to feeding and caring for the hungry with dignity and equity. CCN was founded by Mt. Pleasant Community Church and rapidly grew into a community-wide, charitable organization. CCN provides supplemental food to individuals and families in need. The organization has been hosting mobile food trucks every two weeks, serving approximately 225 families each time. Forty percent of those who come to the CCN mobile food trucks are over 60-years-old and have worked their entire lives, but their social security is no longer sufficient to cover food, rent, heat and medication. In addition to the mobile food trucks, CCN packs 600 bags of weekend food for local children in partnership with Isabella County schools. While there are several small food pantries that serve portions of Isabella County, CCN is the only pantry that serves residents county-wide with the only requirement being that guests meet USDA poverty guidelines. A grant from the Community Impact Fund and W. Sidney Smith and Judith French Smith Family Fund in late 2017 helped CCN to open and stock a stationary food pantry that opened in January, 2018. Based on their history with stationary pantries, CCN anticipated serving almost one and a half times the number of families served by the mobile trucks. Grant dollars were used to purchase food through the Greater Lansing Food Bank, a regional affiliate of Feeding America, at twelve cents per pound. The CCN stationary pantry is now open four days a week, approximately four hours per day, and is located at 1114 West High Street in Mt. Pleasant. Clothing INC has operated a clothing closet in our community since 2005. The mission of Clothing INC is to make an impact on the lives of underprivileged in the area by providing free clothes to those in need. The Staples Family Fund and the Weisenburger Family Fund provided grant funding in 2017 for Clothing INC to purchase three-drawer storage carts, large bins, 177 totes and a computer. Before the grant award, undergarments were stored in totes under the clothes and on racks. It was difficult for guests to find their sizes because they were required to go through all of the bags and totes. Since moving to 1114 W. High Street in Mt. Pleasant, the amount of new and gently used clothing donated by community members has increased to fill a full shed more than once a day. Volunteers regularly sort and organize the donations, using the bins and totes. Items that are unsuitable for distribution are taken to other local charities. For years, Isabella County Habitat for Humanity has worked to eliminate sub-standard housing in our county by providing safe, decent, and affordable housing for low-income families. With the help of thousands of volunteers recruited and trained to build houses for those in need, Habitat for Humanity of Isabella County has constructed more than 35 homes. Proceeds from sales at the Habitat for Humanity ReStore, located on Pickard Street in Mt. Pleasant, allow the organization to advance its mission. The ReStore sells new and gently used items that have been donated by community members. Appliances, furniture, cabinets, windows, and building materials may be donated and purchased at the ReStore. A large portion of the ReStore building was left unfinished resulting in minimal insulation in walls and ceilings. Without insulation, extreme temperatures in the summer and winter greatly affected the people working inside. Habitat for Humanity was in need of materials to properly finish its own building. A finished interior would encourage sales, which directly impacts the organization’s ability to serve more families in our community. The Mt. 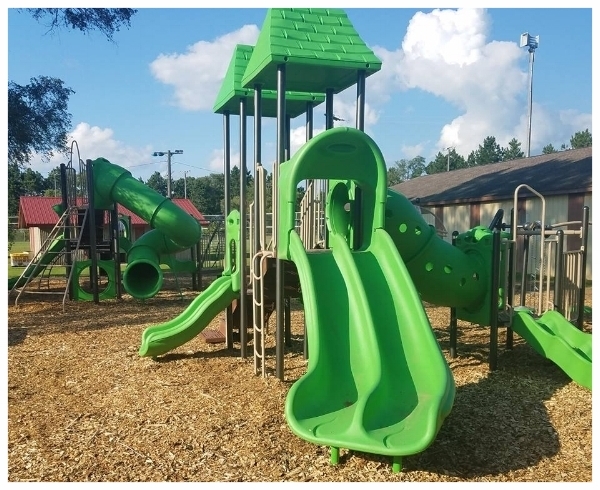 Pleasant Area Community Foundation recognized the importance of properly finishing the facility and awarded Habitat for Humanity a grant from the John R. and Constance M. Harkins Community Fund. The finished building enhances the experience for dedicated volunteers and staff, and results in better service to donors and shoppers. Isabella County Habitat for Humanity works hard to provide a hand up for families in need. With the finished building, the ReStore may continue to help families in need of good, safe, and affordable housing. Sacred Heart Academy (SHA) recognizes that engaging with the newest technology is important for their students. Sixth grade teachers at the school believe that one of the best ways to engage children in math and science is to use short-throw projectors. These projectors essentially turn any classroom whiteboard into a SMART board. The Kellogg Youth Fund recently provided funding for Sacred Heart Academy to purchase two short-throw projectors for the sixth grade classrooms. The projectors connect to teacher computers and allow students to engage in problem solving in math and science using interactive websites. For example, students are able to follow along in math lessons, actually seeing the work steps needed to solve an equation. According to sixth grade teacher Kathy Wyman, "I am able to project an entire math problem and the steps necessary to solve it. By being able to do so, the students are able to see how our work flows and fits together throughout the entire problem rather than seeing it in chunks or individual pieces. We see the complete puzzle." The short-throw projectors are easier to see compared to flat screen television screens. The entire whiteboard turns into an interactive avenue for the students to learn. Thirty SHA students have benefited from the new technology this year, and future sixth graders will too.